Don't let your fresh produce and garden crops go bad! 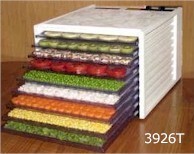 Dehydrating is the fastest, easiest and most nutritious way to save and store your summer produce! Why spend days slaving over a hot canner when dehydration preserves about 97% of vital nutrients as opposed to canning with only 40% and freezing preserves about 60%. This is a "no brainer"! Your dehydrator works while you sleep.